The N in IBD's CAN SLIM investment system can stand for new products, new services or new management. The N also stands for new issues or initial public offerings (IPOs) that are so strong that they go on to reach new highs. Just as new toys can bring children happiness, new issues that come to market can bring investors joy. Some IPOs have gone on to become huge stock market winners. While new issues can be volatile, they can turn out to be some of the most profitable. When a hot, new company sells shares of itself to the public, it's tempting to buy right away. But it's often prudent to wait for new issues to form an IPO base first. Many new issues tend to be quite volatile on their first few days or weeks of trading. Don't buy into the early hype, as you may get shaken out easily. Just like other stocks, an IPO needs time to go through a consolidation period. Let it digest gains and let the early enthusiasm settle down to form a base. 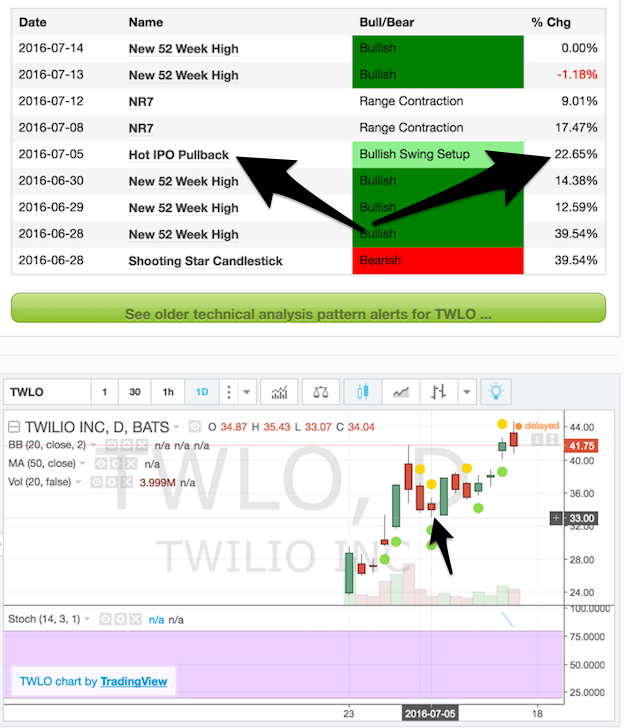 Here are the ways I use SwingTradeBot to track IPOs. I use one of my watchlists solely to track the IPOs I don't want to slip by me. Once an IPO gets on my radar for whatever reason, I'll add it to my IPO watchlist to ensure that I don't miss a good setup. Look at how many days its been trading. If it's only been trading a few days then it hasn't had a chance to base and I won't be that interested in trading it the next day. I may add it to my watchlist though. 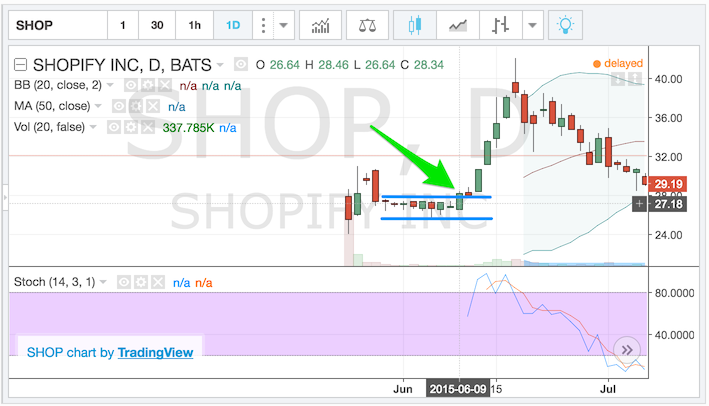 Use the hover charts to get a quick feel for the pattern(s) the stock is building. When I see a pattern that I like I'll open that stock in a new browser tab and then decide what to do with it (enter an order, add to watchlist or do nothing) after a bit more examination of the chart & company. Other useful / interesting sorts for that table are by volume surge and percent change for the day. Both of those sorts can surface stocks which had some important news and may be starting a big move. Another thing I'll do on that recent IPO page is sort the 'recent events' table by event. Then I'll go through the table and look at stocks which had specific events for that day. Here's an example of a trade I took last year in SHOP, which is also an example of why I like range contraction setups. It had a big gain on its first day of trading and then pulled back and fell into a tight trading range. It triggered a Hot IPO Pullback on May 28th, 2015. So it was solidly on my radar. I remember entering "good for day" orders just above the high price of the 28th a few days in a row which never triggered. Then I just decided to put in a "good until canceled" order above the blue line on the chart. Once it finally triggered (I was on vacation when it did) it ran about 50% higher in seven days. Another great example is ACIA, which showed up on the Hot IPO Pullback scan 3 days in a row immediately after its first day of trading and then, about a month later it had 4 days in a row of '1,2,3 Pullback Bullish' alerts. It's currently up about 85% from those Hot IPO Pullback events and 40% from the 1,2,3 Pullback events. There you have it -- a few ways to use this site to find good IPO candidates to trade. I hope you find some good trades with these tools.